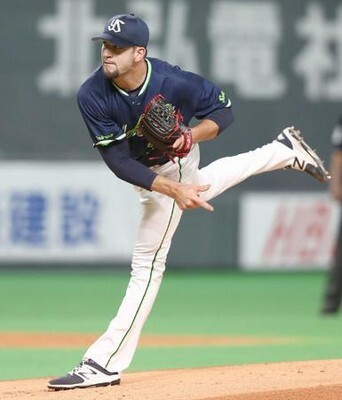 Matt Carasiti made his first start for the Yakult Swallows over the weekend. This week on the Japan Baseball Weekly Podcast, John talked to Matt Carasiti of the Yakult Swallows. We then talked about Japan’s new interleague highest-win-percentage team, Eagles manager Masataka Nashida quitting to due his team’s poor record, NPB’s home run explosion and a listener’s question. As mentioned before, the Japan Professional Baseball Players Association has asked NPB about changes to the baseball since a number of players have reported that the ball seems to be carrying more for them this year. Today, the union’s secretary general, Tadahito Mori, said he had not asked NPB for the data, and had not yet considered conducting its own study to explain the increase in home runs, but that the union executive may consider that possibility going forward. A reader asked whether launch angles might be contributing to the location, and there appears to be some of that going on, since groundouts are decreasing slightly across NPB. More as this develops.